Siemens Gamesa Renewable Energy was created in April 2017, following the merger of Gamesa Corporación Tecnológica and Siemens Wind Power. The new company employs 27,000 employees globally. It has a combined installed capacity of 80 GW in more than 90 countries, across five continents. The company ranks second in global installations, second in global onshore wind, and first in offshore wind with 8.7 GW installed across Europe. In January 2015 the company started the construction of a blade manufacturing plant in Hull (Yorkshire and the Humber) in the UK. The plant became operational in 2016. The location was a strategic choice given the importance of the UK in offshore wind, in particular, the region of Humber and Alexandra Docks. remaining £150m was provided by Associated British Ports (ABP). The manufacturing site produces 75-metre turbine blades. All production at the plant during the first two years of operation will serve the domestic market in the UK. In the future, the company expects to export part of the production to supply new projects in the North Sea region as well as international markets. Since the first day of operation 1,000 direct jobs have been created at the manufacturing site. Almost all these employees (97%) were directly recruited from the region of Hull or within a 30 mile radius. In the first phases of the development of the plant, the initial workforce reached 650 employees, after more than 23,000 professionals had applied for a post. Significant employment has also been created indirectly through the procurement of goods and services from local subcontractors. learning disabilities to live independently and find a job. 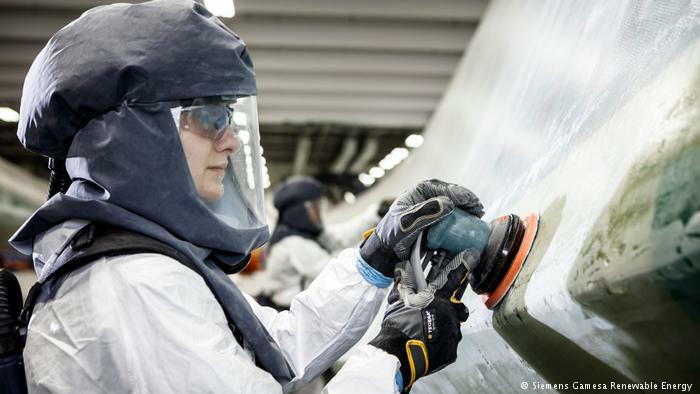 It is estimated that the use of the turbines produced by Siemens Gamesa Renewable Energy in Hull’s blade manufacturing plant can cut CO2 emissions by over 1 million tonnes per year. Source: Local impact, global leadership. The impact of wind energy on jobs and the EU economy, WindEurope.